This specific rebounder trampoline boasts quick and easy assembly, requiring no additional tools. Its jump mat consists of heavy-duty polypropylene to ensure sustained bouncing. The trampoline is constructed with 30 high tension dual-springs with steel rubber-tipped supports, making the trampoline sturdy. 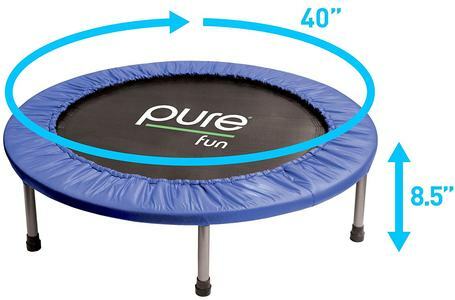 Being only 40 inches in diameter, the Pure Fun trampoline is both compact and portable, allowing for it to be taken and used almost anywhere, both indoors and outdoors. Because of its sturdiness, the mini trampoline is suitable for people 13 years of age and older. The benefits of using a rebounder mini trampoline, specifically this one over any other brand available, is that the exterior trampoline pad is cushioned. This allows the user to avoid injury if bouncing out of control. 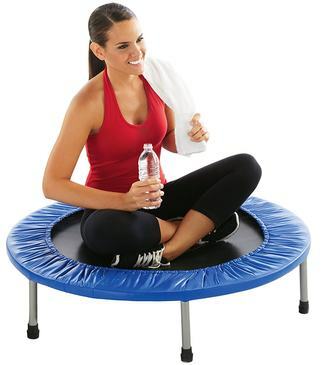 Other benefits of using a rebounder mini trampoline mentioned are similar to those claimed from using any other trampoline, such as improved cardiovascular health, lymphatic drainage, and leg and core strength. These benefits can be achieved through the various trampoline exercises that can be performed on the mini trampoline. Of course there is the basic bounce, but an exercise trampoline has more to offer than just bouncing up and down repeatedly. Exercises to do on a mini trampoline include jogging, heel-toe bounce, and jumping jacks. After bouncing for 20 minutes, switching to jogging on a mini trampoline is an excellent way to increase heart rate and burn fat faster. Bouncing in a heel-to-toe pattern serves as a good aerobic workout and targets belly fat. Doing jumping jacks on a trampoline versus solid ground significantly reduces impact and provides a total-body workout. The assembly process for Pure Fun Mini Rebounder Trampoline claims to be both easy and safe. Only one person is needed to assemble the frame with no outside tools. Since the parts already arrive preassembled, all one would have to do is take the caps off of the threads on the trampoline and screw the legs on, making it okay to assemble around small children, opposed to cheaper versions of this trampoline which require additional assembly. The trampoline comes with a 90 day limited warranty, so if a spring happens to break or the product isn't up to par with the customer's expectations, either the broken parts can be replaced or the customer can return the trampoline and receive a refund within 90 days of purchasing it. At only around $45, this mini rebounder trampoline comes at an affordable price when compared to other high-end rebound trampoline brands that charge well over $200 for virtually the same product. The frame and actual body of the trampoline are made of sturdy, high quality material, which allows for regular bouncing on it. ​The jump mat itself is made of high quality material, so little to no noise is created when bouncing on this trampoline; other activities can be performed while exercising, such as watching television, without worrying about distracting noise. ​In reviews, buyers with small children claimed that this trampoline made a great gift and exercise toy for their kids; it encouraged physical activity among their children and also helped kids with ADHD, autism, and other developmental disorders. 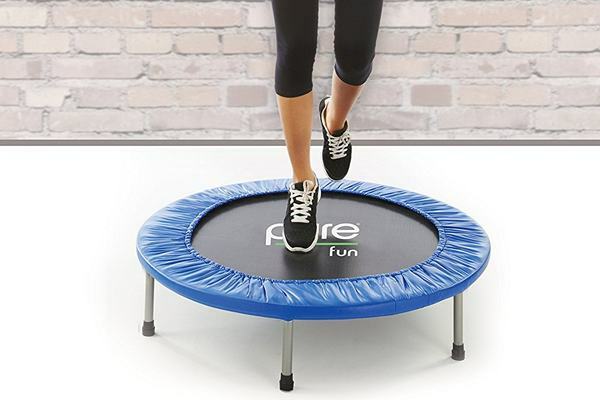 ​As mentioned previously, this mini rebounder is both compact and portable, so exercising would no longer be limited or dependent on the weather; if it is raining outside, the trampoline can simply be taken inside and used within the comfort of a home. ​Most people buy and use this trampoline to see the health benefits associated with rebounding, and as claimed by the company, almost all people experience the desired health benefits and found bouncing on the trampoline to be not only beneficial but fun as well. ​A large quantity of people experienced a detoxed lymphatic system, toned legs, and cardiovascular improvement within months of using this product, and because of the equipment's relatively low impact on joints, there were no claims of increased stress on joints or joint pain. There are few complaints about this particular trampoline. One main gripe is that the springs are not as strong as the company portrays them to be; many people had issues with a spring or two breaking, even though they were under the weight limit. Although there is a 90 day warranty in which parts can be replaced if damaged, having springs break within the first few months of use is inconvenient, especially considering that if one spring breaks, the trampoline cannot be used during the period of time in which the spring must be replaced. Although the bounciness of the trampoline is subjective, many people found that the material the jump mat was made out of to be too stiff to get a good, high bounce on.